The planets aligned... New acquisition coming! Re: The planets aligned... New acquisition coming! My good shooting pard, Hanging Judge Hemp, and I are going to a fun match on Sunday. It is an old style SASS match with smaller, farther targets, goofy lines in the shooting scenarios, and lots of props. Modeled after the way matches were 20 years ago. taking the New Jersey made Navy Arms Henry with me. Judging by what I found the tear down, it is unfired! Oh well, I don't own a firearm I won't shoot! It is six stages, though and I am bringing my .38 WCF 1866 short rifle too. Mine on the other hand was well used , no telling how many BP blanks were shot through it ( BTW my blanks were custom 444 Marlin brass shortened & neck down to feed ) and gaggle of 44/40 live rounds . The two biggest tells that a NA Henry is US made and pre-Uberti are the 1866 side plate screw and no lock on the nose end of the magazine. My spring has no kinks, and the follower was in backwards. ...the follower was in backwards. Sounds like a "leader" instead of a follower. I've known more than a few "leaders" who "led" from the rear. Kind of backwards. All joking aside, I get vicarious enjoyment from your reports about your new rifle. Thanks. Thanks! There is something special about owning this piece of history. According to my research, they only did 500 24" in 44-40, and 1,000 in the 22" carbine model. Knowing it was made by the New Haven Arms factory for Navy Arms adds an extra dimension. Even If I wasn't a CAS shooter, I would treasure this one. Another thing, the extractor is milled out of the same piece as the bolt. It is not flexible like the original Winchester 1873 type. Anyone know if the original Henry had a removable extractor? You sure it doesn't just LOOK like it's milled out of the same piece as the bolt? I just can't see how that would work at all. The bolt loads the cartridge in a straight line, so the extractor HAS to be able to spring over the rim, doesn't it? Me and the new Navy Arms Henry at the old time type match today! Targets and scenarios like they were when SASS started. 25 yard rifle target, 10-12 yard pistol target, and NONE were the popular 24"x24" plates. You actually had to aim. I shot clean with the Henry, except the last darn shot of the match! LOL. Boy this sucker is tight. It was unfired until today. 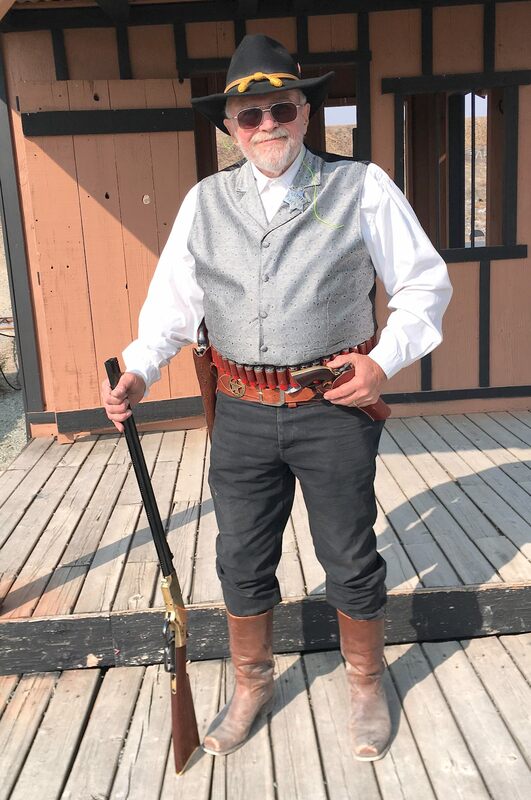 The pistols are an 8" barreled Cimarron 1860 Type II Richards Conversion in .45, and a Pietta 1851 .44 Caliber with a 4 3/4" barrel, and a Kirst gated Konverter in .45, with Kirst ejector rod assembly. Also, on closer inspection, I believe the 1860 does have a separate extractor, not milled as part of the bolt. Fit is SO tight and close, it looked like one piece. LOL! Those are my Sunday goin' to meeting" duds. 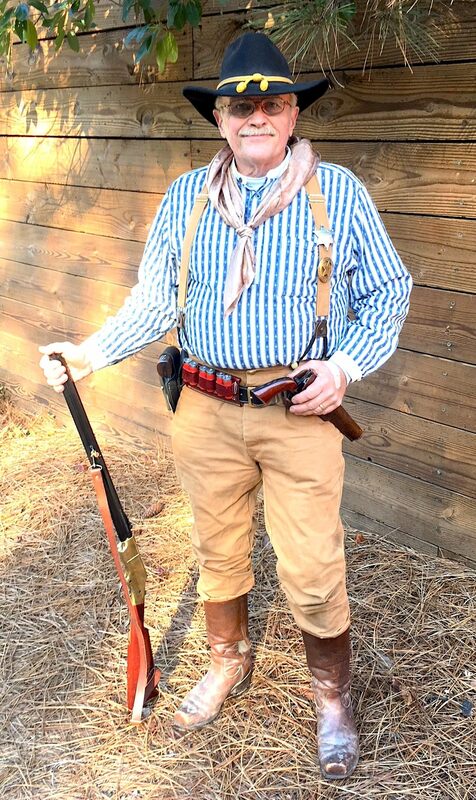 I figured since it was my first date with an elegant lady (the 1860), I ought to dress accordingly! Now I have to load up more 44-40. I have 250 rounds of 38-40 for the 1866, but just one box of .44 WCF left after Sundays match. The Henry loved my load of 7.0 grains Trail Boss with a .428 Bear Creek or Missouri Bullet company 200 grainer. That load, not coincidently, gives me 1120 fps!!! Imagine that, the same velocity and bullet weight of the original .44 Flat rimfire. It is way below "the full case to base of bullet being maximum" alternative of Hodgdon. They said fill the case, and then figure 70% for a starting load. This is actually only about 85%. My wife and I were having a lazy day today, so we decided to do a Lonesome Dove and Return to Lonesome Dove marathon on DVD. It the scene where they take on Jake Spoon and the rustlers, you get a brief close up of the receiver of Cpt. Call's Henry. It clearly had the 1866 type side plate takedown screw, meaning it was an early Navy Arms manufactures Henry like mine. Not too surprising, as in 1987 when they were filming it, the Uberti made 1860s were not too common either. I have to confess that seeing Gus and Call with their Henry rifles when Lonesome Dove when it first came out caused me to want a Henry when I started in SASS in 1994. He also did the guns for Sellick's "Last Stand & Saber River" & "Crossfire Trail" ( including the Evans ). Yep, that's it. His name escaped me. Thanks. What one do you have? BRAVO! Very happy for You! That's a piece of Henry History! Update: Still using the Navy Arms original Henry as a main match rifle. Love it! It has so much class. I toyed briefly with getting a Marlin 44-40 and doing a later persona but just can't leave my Henry behind. Of course if I found a screaming deal on a Century Limited Marlin 44-40, I would be tempted to have it also. a coupla years ago I picked up a NIB circa 1989 Marlin Classic Limited 32-20. It was unfired and precisely the caliber I wanted and what I was looking for. I do have to say the Century Limited Marlin in 44/40 , case & engraved is a BEAUTY , Friend of mind just got ascreaming deal on one at the NCOWS convention....The Bucket list continues.